Looking for some properly spooky music, either for your game tonight or just for the Trick-or-Treaters? 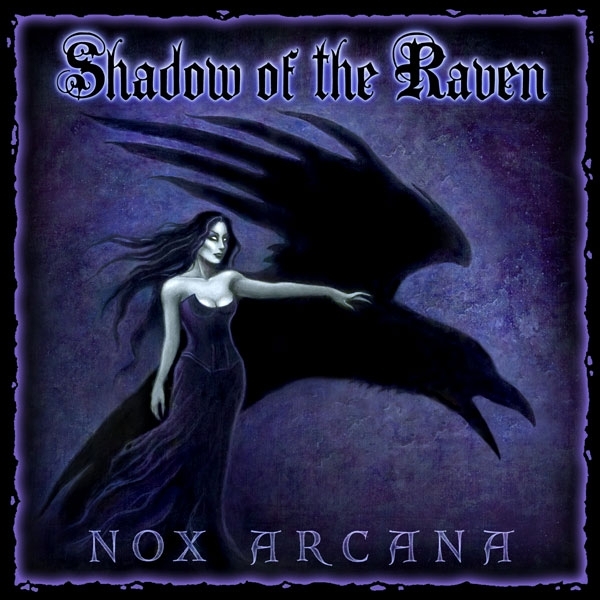 Try out Shadow of the Raven, inspired by the American Master of Horror, Edgar Allen Poe! While you’re at it, check out all the spooky music selections they have at DriveThruRPG! I did the filtered search for you already! It’s kind of a boom-time around here at Evil Beagle Games, and here’s another product to prove it. Phil Vecchione and I give folks a lot of great background and character creation material for their goblins, orcs, and ogres in Shaintar. As always, really cool stuff here for any Savage Worlds fan. Welcome to the Goblinesh Gathers! By now, you’ve seen a few things come out, after a very long time where more or less nothing was happening. 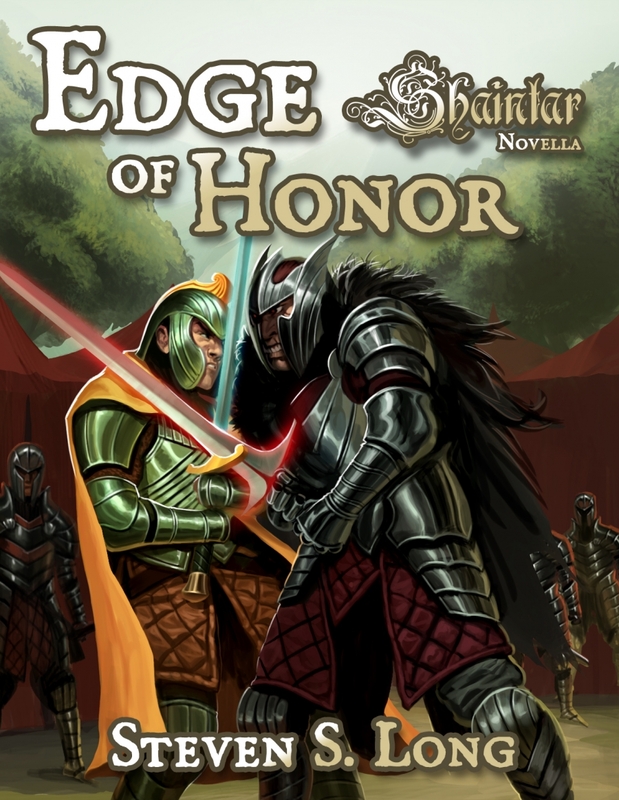 Most recently, we’ve released the novella, Edge of Honor, and Guidebook Goblinesh. I’ve turned in Magic and Cosmology: Volume I, Godstrike Tempest (which I co-created with Miles M. Kantir), and the city book, Eastport, is almost done. That latter one isn’t specifically a Kickstarter product, but it’s a great piece that was done for a bespoke book, and we’re looking forward to sharing it with the Shaintar fans at large. We have drafts for Guidebook Kal-a-Nar Empire, Black Lantern Report: Snakes Den, Black Lantern Report: Mercenaries, the novellas The Hunt of the Midnight Dominus and One Night in Zanfar, with many more drafts incoming. In other words, we have more progress and development for the Shaintar product line than we’ve yet seen. This isn’t going to stop. We are off and running, with Carinn editing like mad, and Ross managing the product flow and increasing the output on all fronts (as well as throwing some great words onto the screen all over the place). Savage Mojo continues to flow words into layouts, embed graphics, and get exceptional artists crafting wonderful pieces for all of these books. With all of this in mind, I am continuing my practice of total transparency and keeping faith with all of you as I bring you up to date on some revelations and new developments. I’ve been struggling with some serious emotional issues where Shaintar is concerned. Most of you know this already – that’s not the Big Reveal here. What’s not been made completely clear, however, is the major reason why this is true. Not because I was holding anything back, but because I only recently (thanks in part to some new things that have happened in my life) came to terms with these truths for myself. I struggle with Shaintar because I’ve been something of an indentured servant to it for a few years now. This has been especially true since the Kickstarter (which, by the way, is not at all an uncommon phenomenon, as I’ve spoken with many others in similar circumstances). Bad planning, over-promising, and other factors left me in the position of making so little off of every produced product as to make the entire situation untenable as a professional endeavor. … Yet as a professional writer and game designer, I am a shambles under the current circumstances. I am not able to contribute meaningfully to my family’s welfare; what I make barely helps buy some gas for the car once in a while, or pay for a meal out every now and then. I won’t belabor the details here, but the upshot is that I am not making anything close to a living because of how this all played out. This, in turn, creates resentment and depression, which cyclically results in a complete lack of productivity, and so on. Now we come to today. An incredible opportunity is given to me (and to Evil Beagle), one that will ensure my capacity to actually make a living doing what I love while building Evil Beagle into a serious design and publishing operation. It’s a project I am incredibly excited about working on; I am being entrusted with an iconic IP and a product line that will no doubt become one of the definitive series of releases into the RPG marketplace for years to come. I cannot reveal any details at this point, and will not confirm anything until such time as all principles are ready to talk about it, so please don’t ask me to. I hope at this point, you can understand why I must accept this opportunity, grasping it with both hands and for all I am worth. I need to be able to function as a productive human being, making a living wage and contributing to my family’s well-being. I need to enjoy doing what I do again. At the same time, I must and will continue to fulfill my obligations to each and every backer of the Shaintar Kickstarter. Regaining my emotional center and my enthusiasm for this hobby and industry is key to that, in fact. I take you back to the beginning of this message, where all of these excellent products are coming out now. Through the combination of extraordinary people signing on and working on many of them, as well as my renewed sense of purpose and happiness, Shaintar can slowly turn back into something I love, rather than endure. In other words, I might desire a bit of travel to other lands, but Shaintar will always be my home. So how will all this work? First off, as stated, we are bringing in wonderful people to contribute to many of the projects in question. Drafts are flowing in constantly, thanks to Ross Watson’s exceptional planning and management, as well as Carinn’s constant editing. There’s an actual backlog now! That will likely continue for some time, as the fantastic folks at Savage Mojo keep doing their magic for each book. Second, I will be scheduling myself regular hours to work exclusively on Shaintar content, in addition to this new project. Honestly, even with a specifically “part-time” approach to hours committed to Shaintar, you will see far more productivity from me than has been true for well over a year. Staring morosely at a screen, trying to create and failing, as a full-time occupation got us nowhere; hyper-focus at part-time every week, excited and energized, will result in far more fruit from the tree. Honestly, I could have waited until official announcements started to appear about the Big Project before saying anything, and I don’t think you would have noticed anything other than more stuff coming out. However, that’s not how I roll here; I wanted to be able to look any one of you in the eyes and say unequivocally that I told you right away all that I could, when I knew about it. Your commitment to me – expressed through your financial backing of Shaintar and your continued patience and support – deserves no less. As always, I am open to each and every one of you for questions and comments. I hope you are enjoying the products that have already come out, and will enjoy all that continues to flow forward. I also hope you will be excited for me and this new opportunity, in which I can regain the better part of my creative self and return to being productive and happy. Savage Mojo’s pleased that Sean has an amazing opportunity coming to him. It’s a testament to the excellent work he has done with Shaintar. 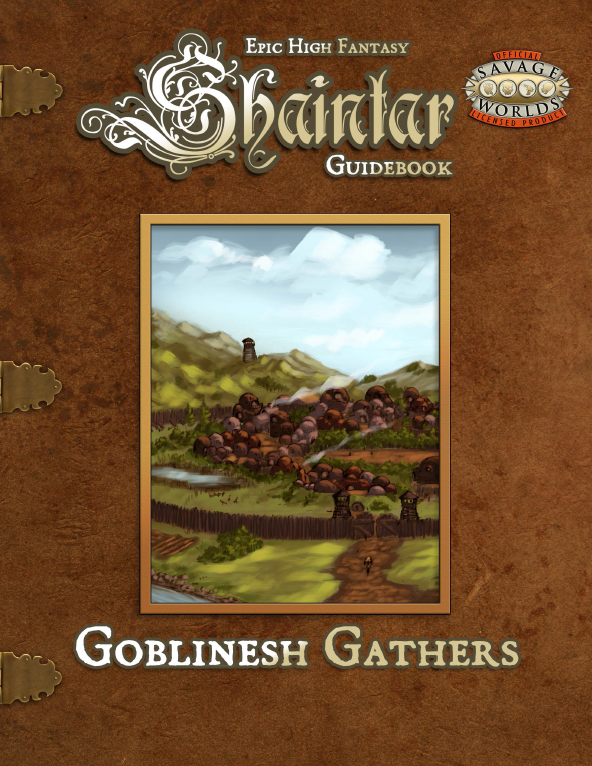 From our perspective, we remain committed to ensuring all the rewards from the Shaintar Kickstarter are produced. We plan on continuing to take these awesome manuscripts and turning them into books with the high production quality you’ve come to expect from a Shaintar product. Our commitment to that ongoing goal means we’ve talked with Sean and his Evil Beagle team, agreeing a change in the administration of the Kickstarter. In order for Gayle to oversee the process of finalizing the books as quickly as possible, we’re handing over management of the Kickstarter to Evil Beagle’s ever-efficient Carinn, who’s relishing being in touch with all you backers and distributing all the books as they’re finished. Each time we finish a product, we’ll hand it over to Sean, Carinn and Ross and they’ll distribute it to you through the OBS (DriveThruRPG/RPGnow) system. They’ll make sure an announcement goes out via the Kickstarter system so you’re aware it’s coming. We appreciate your continued support of Shaintar. Sean’s had a tough time and you’ve all stuck by him. Now he has a way forward and we’re looking forward to seeing it all come together. We’ve seen a number of manuscripts in recent weeks and are just as excited as you to see others just around the corner. Another just-in-time release, here’s a great cemetery for GMs to situate their PCs into before unleashing massive horror and terror upon them. 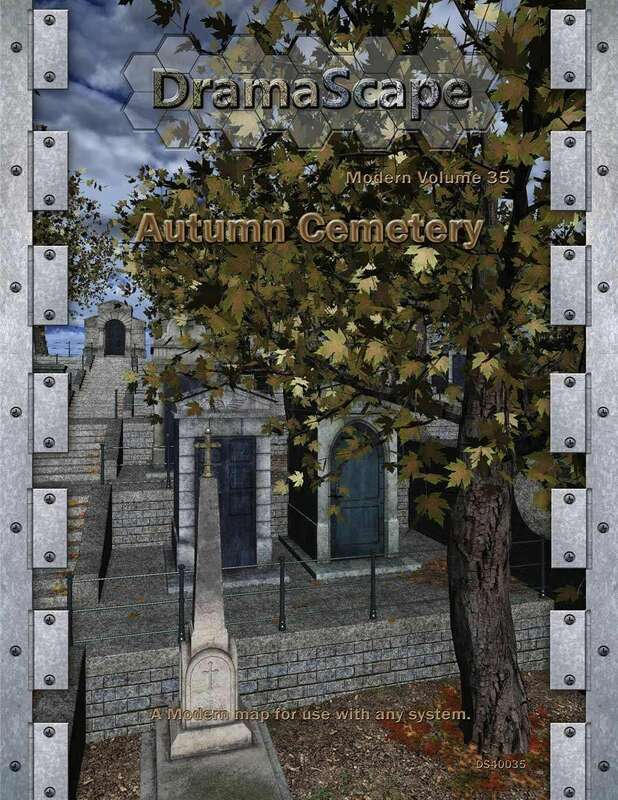 DramaScape dares you to enter our Autumn Cemetery for your Halloween-themed games this year! A combination of fallen foliage from trees and creepy mausoleums and coffins make this map perfect for Horror games set in autumn. Autumn Cemetery is a single exterior map of a well-maintained cemetery in the midst of fall season. The wind continues to howl and blow leaves all over the cemetery from the trees, much to the chagrin of the caretakers. Autumn Cemetery is intended for use in horror and modern settings. It could also be easily used in fantasy settings as a cemetery with a high degree of reverence for those interred there explaining its well-maintained state. I am more than thrilled to announce a new Shaintar release today, and this one is a wonderful work of fiction by the inestimable Steven S. Long! Explore the Edge of Honor. Khoroth ki Khorond is destined to become the Warlord of the Azdairian holdings, a position of great wealth and power in the Kal-a-Nar Empire. His longing for the days when his people knew honor as greater than mere glory – when they did not succumb to the bloody, fiery whims of the worshippers of the Queen of Hell – puts him on a path of terrible sacrifice and pain, and ultimately in direct battle with his all-too-powerful father. It can be devilishly difficult to create genuine horror at the game table, especially with particularly experienced gamers. The folks at Pelgrane Press get it, and they have the chops to create material designed to help the GM make the horror personal and very involving. This is where the Book of Unremitting Horror comes in. Players in horror campaigns are a little too accustomed to the nightmares their characters face; even the most eldritch of tentacular horrors is less intimidating when you know exactly what it is, because your PC has faced it before. New times demand new nightmares. This, therefore, is a book of horrors, not a manual of monsters. The horrors are nightmarishly intimate, often created from human vice, or let loose by human greed. They show us the ugliness that underlies reality. They are the crawling things under the rock of the everyday, sane world. Consequently, we’ve detailed our creatures in depth. Each one has its own agenda, its own reason for existence and its own legend. We’ve made these creatures unusual, frightening and bizarre, yet sufficiently comprehensible that they players realize they are up against something intelligent, if inhuman. I rather imagine most gaming fans also enjoy comics, which is why today’s Pick is the Halloween Sale going on at DriveThruComics. With over 200 digital titles marked down by 33%, you’ll find endless costuming ideas (and some great reading). Take note of the decidedly gamer-related titles, like the Deadlands comics! Continuing the seasonal theme, here’s a ton of stuff for anyone wishing to get a little “witchy” with their Pathfinder character. 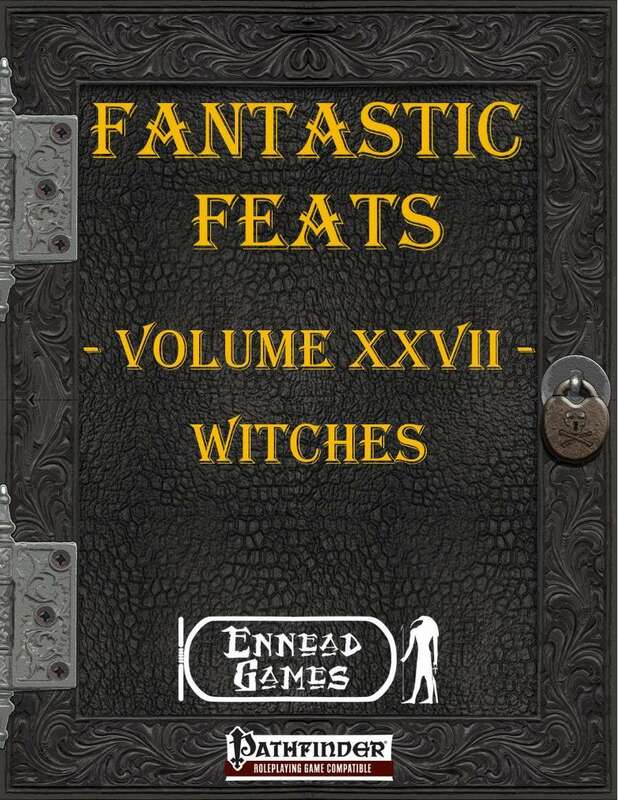 This edition of “Fantastic Feats” – a series of feats based around a certain theme or subject – is about Witches, those magic users who draw their magic from other worldly powers. Patrons Blessing – The Witches patron can provide an extra bonus, but don’t anger them! One of the many things I am proud to have had a hand in was the creation of the “Teach Your Kids to Game” produced by DriveThruRPG called First Fable. 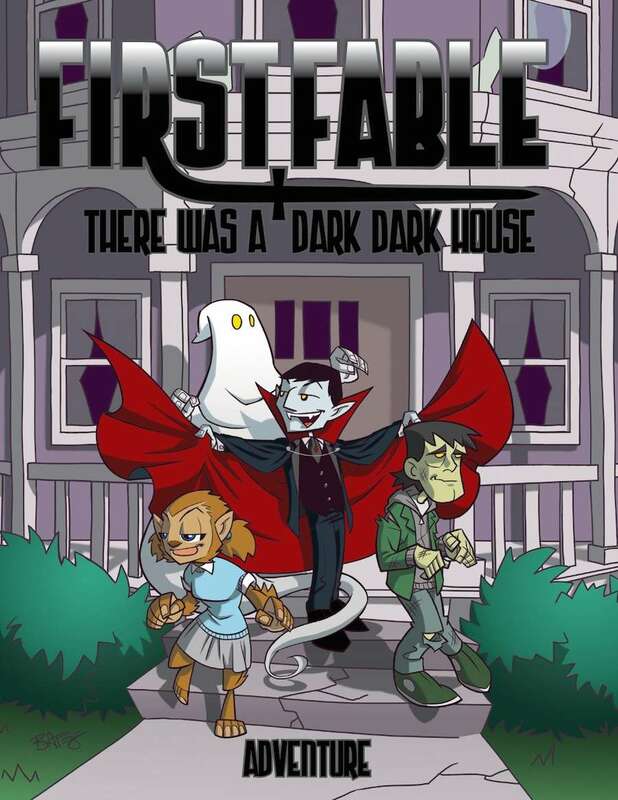 My friend Matt McElroy and the highly-talented Crystal Mazur put together a properly spooky Halloween-themed adventure for it called There Was a Dark, Dark House, and I am just thrilled! Even better, portions of the proceeds go to the RPG Creators Relief Fund, which I am also proud to support. The official DriveThruRPG Halloween Sale is now on (all that came before was the “pre-holiday” sales action, because – you know – sales!). Select thematic and other products on sale for 33% off. Delta Green. Achtung! Cthulhu. Orpheus. Book of Vile Darkness. Clockwork & Cthulhu. Dozens more.